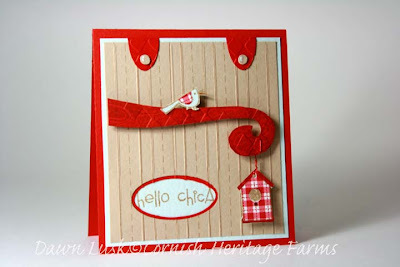 I combined our CCEE challenge with my CHF Design Team color challenge using Prism paper colors Tawny light, Iced Teal and ClassicRed. Whoo Hoo! We are all hear except Charlene and she's putting her's on tonight! I love your little birdie card Dawn...its precious! What a cute card! I love those colors and your little branch!! So sweet Dawn!! Love the branch!! love this dawn....great colors...fabulous peicing and love the tab tops!